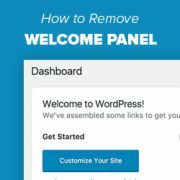 Do you want to remove the welcome panel in your WordPress dashboard? 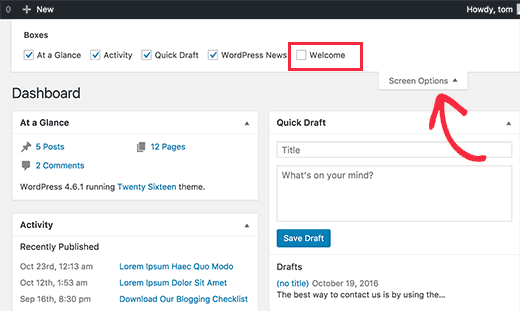 The welcome panel is a box added to the dashboard page of your WordPress admin area. It contains shortcuts to perform different tasks and helps new users find their way around. 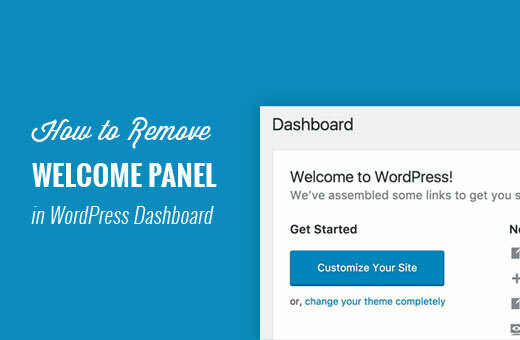 In this article, we will show you how to remove the welcome panel in WordPress dashboard. Why Remove Welcome Panel in WordPress? Welcome panel is a meta box added to the dashboard screen of WordPress admin area. It shows shortcuts to different sections of your WordPress site. The purpose of the welcome panel is to help beginners find their way around WordPress. However as you become more familiar to all these locations, this panel will become less useful for you. Having it on the screen, pushes down other important dashboard widgets and make them less noticeable. 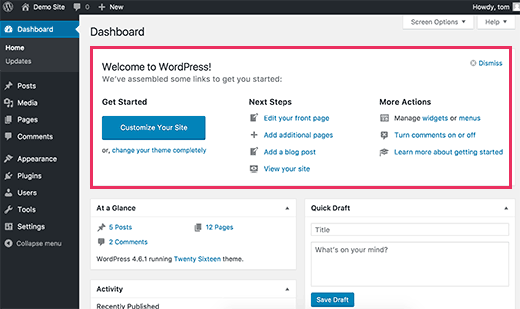 Let’s see how you can easily get rid of the welcome panel from your WordPress dashboard screen. There are multiple ways to hide and even completely remove the welcome panel. The easiest way to remove it is by simply clicking on the Dismiss button at the top right corner of the panel. You can also remove the welcome panel by clicking on the Screen Options button at the top right corner of the screen. This will bring a fly down menu. You need to uncheck the checkbox next to ‘Welcome’ option. Both methods mentioned above will hide the welcome panel. You can access it again by clicking on the Screen Options button and checking the box next to Welcome option. However if you want to completely remove the welcome panel even from the Screen Options, then that’s also possible. This method requires you to add code to your WordPress site. If you haven’t done this before, then take a look at our guide on pasting snippets from the web into WordPress. This code simply removes the action that adds the welcome panel to the admin dashboard. You can now visit the dashboard screen and click on the Screen Options menu. You will notice that the welcome panel option will no longer be available. That’s all. 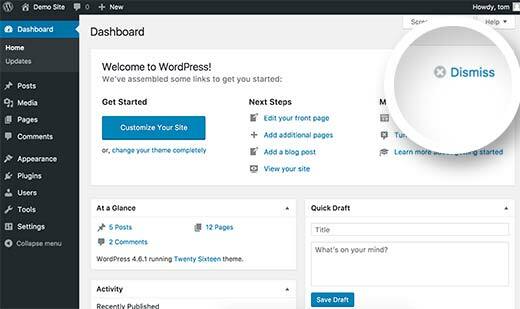 We hope this article helped you remove the welcome panel in WordPress dashboard. You may also want to see our list of 19 actionable tips to drive traffic to your new WordPress site. Thank you for the tip, but how can we update it or customize the user outputs not removing or hiding it? can you help in this please? I want to delete panels 2 and 3 from my static HOME page, but keep the menu item selections that appear at the top of that page (Affinity theme)—Or at least make them match the pages that are linked at the top of the page. How can I do this?? I’ve been searching and stumbling around forever. How do you delete a an installed theme from wordpress? Simply login to WordPress admin area and go to Appearance » Themes page. If the theme you want to delete is currently active, then you will first need to switch to another theme. After that you can click on the theme you want to delete and then click on the Delete link. How do you delete wordpress from a domain? Hi, I completed creating my website, but I accidentally clicked the dismiss button, I am new to this & I want it back. I tried clicking Screen Options menu but | don’t see the welcome option. How can I get this fixed. Thanks. The Screen Options button is on the top right corner of your screen just below the WordPress admin bar. Hi how can I totaly disable the “Latest from WPBeginner” from dashboard. It comes with one of your promo action, but I dont want it there. Which plugin do you use for creating coupons?